The deeply disparate, often disconnected and increasingly competitive actions of the United Nations and its various agencies, programmes, funds, initiatives and offices in the youth field mostly fail to achieve international co-operation in solving youth problems. Attempts to coordinate and harmonise this cacophony began in 2010, aiming to prevent the different mandates, mechanisms and logics from colliding. What has changed since then? This is Principle VI of the United Nations Declaration on the Promotion Among Youth of the Ideals of Peace, Mutual Respect and Understanding Between Peoples, proclaimed on December 7, 1965. It is not difficult to find young people conscious of their responsibilities in the world, but it is increasingly difficult to understand how the deeply disparate, often disconnected and increasingly competitive actions of the United Nations and its various agencies in the youth field “achieve international co-operation in solving international problems of an economic, social, cultural, or humanitarian character”, as the UN Charter defines the purpose of the United Nations. The UN is certainly not “a centre for harmonizing the actions of nations in the attainment of these common ends,” another principal purpose of the organisation. In fact, the UN has not even managed to coordinate or harmonise its own actions in the youth field. The Human Settlements Programme (UN-HABITAT), the Educational, Scientific and Cultural Organization (UNESCO), the Children’s Fund (UNICEF), the Population Fund (UNFPA), the Development Programme (UNDP), the Programme on HIV and AIDS (UNAIDS), the World Health Organization (WHO), the International Labour Organisation (ILO), the Alliance of Civilizations (AOC) – all these agencies, programmes, funds, offices, organisations and initiatives work on youth issues, and they are only some of the more than 30 UN entities with a youth focus. 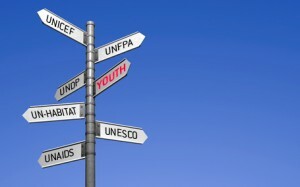 Add competing frameworks and processes such as the follow-up to the International Conference on Population and Development beyond 2014, which will include a UNFPA-backed Global Youth Forum in Bali in December 2012, and the work on the post-2015 development agenda, which will include a UNHABITAT-backed World Youth Conference in Sri Lanka in 2014, and things get even more disparate and disconcerting. It hasn’t helped all that much. The 2012 Report of the Secretary General on “Adolescents and Youth” (pdf) showcases how the analysis of the situation of young people, and the response of the UN, remain completely sectoralised and disconnected. Watched through the lense of one specific UN agency or programme, conclusions are drawn on future actions which are neither coordinated nor aligned with the analysis or action of other parts of the system. The different mandates, mechanisms and logics keep co-existing and colliding, and the long over-due alignment and coordination is prevented by rivaling people jockeying for positions and influence and competing agencies jockeying for money and power. In its entirety, the United Nations is, currently, failing youth. Will the most recent developments — the appointment of a Special Adviser for Youth announced by Ban Ki Moon and the Youth 21 Initiative pushed forward by UN-HABITAT – make things better?